The Como Conservatory’s horticulturalist talks about what’s new at the upcoming holiday flower shows. Really, how would we survive winter without the flower shows in the Marjorie McNeely Conservatory at Como Park? 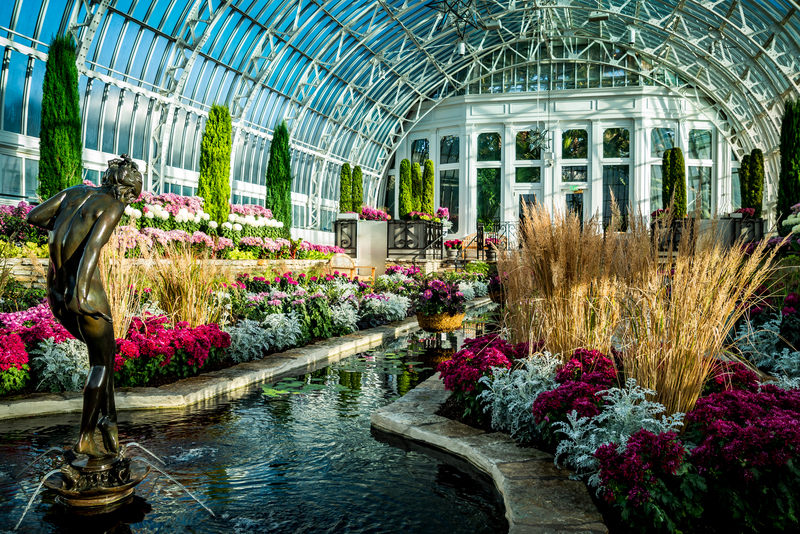 The color, fragrance, running water, warmth: It’s all available to visitors who venture into the conservatory’s Sunken Garden, where the flower shows bloom with majestic splendor. 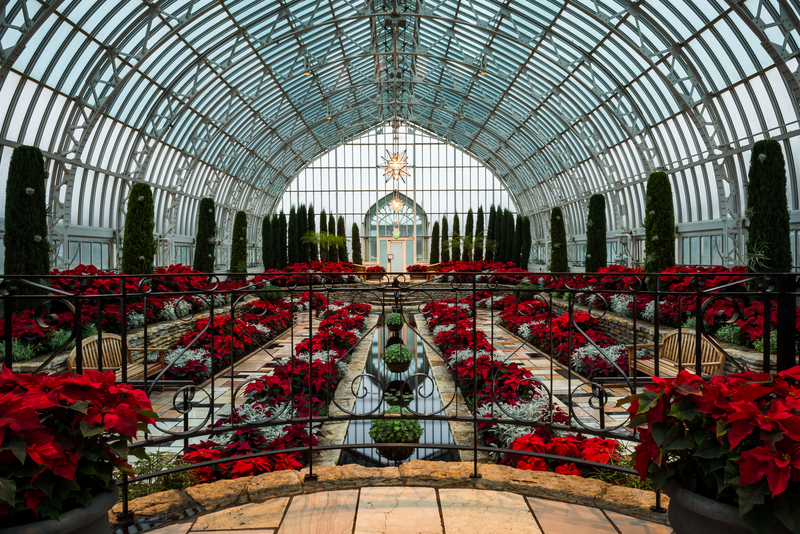 This year’s annual Holiday Flower Show at the Como Conservatory will feature a Victorian theme with festive red poinsettias from Dec. 1 through Jan. 6. The Holiday Flower Show, which runs this year from December 1 to January 6, delighted visitors beginning in 1925. This year’s show has a Victorian theme with all red poinsettias, plus purple salvia, lavender, and scented geraniums. The Winter Flower Show, which runs from January 12 through March 10, features purple azaleas, jewel tones with dark red cyclamen, blue pansies, dark pink/maroon oriental lilies, velthemia, and various amaryllis. 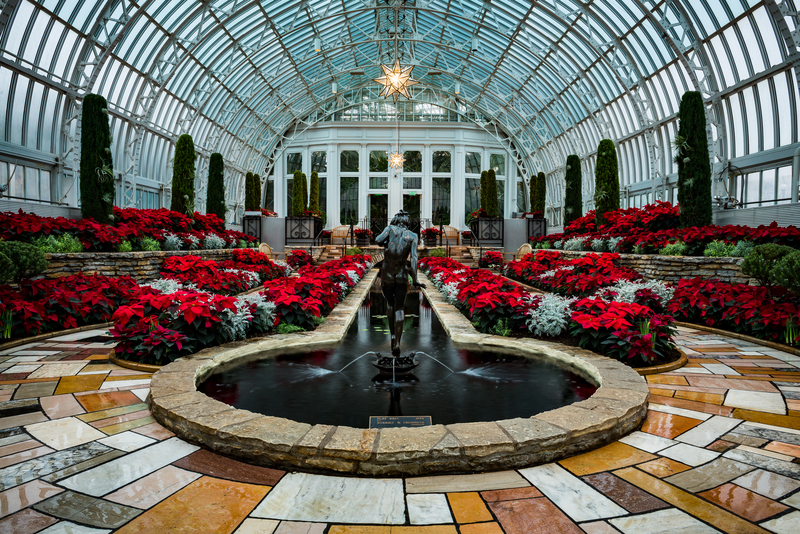 We talked with Paul Knuth, horticulture supervisor for the conservatory, who has been in charge of the Sunken Garden since 1990 about how the flower shows are decided and put together. Who puts the flower shows together? A team of specialists works in the Sunken Garden. We get together throughout the year to plan future shows, so the theme and flower selection goes through several brainstorming sessions about a year before the show will be installed. We come up with a couple of ideas, which coalesce down to the best idea. We travel to conservatories throughout the world, read a lot trade journals and check out trial gardens through the United States and Europe to gather information and ideas about what might work in the Sunken Garden. We try to have the latest and greatest. We’ve had shows based on varieties that just hit the market—ahead of Martha Stewart even! Sometimes we beat her to the punch. What can we look forward to with this year’s Holiday Show? The poinsettias are all red—but different from a traditional red and in just two varieties: Valentine and Winter Rose Dark Red. The modified leaves are what we think of as the flower, and these have a cupped instead of a flat appearance. They have an old-fashioned look that fits the Victorian theme. One of the poinsettias can be used as a cut flower. We don’t grow extras for the gift shop, but you can probably find this varietal at better flower shops. Fragrant jewel tones will abound in the conservatory’s upcoming Winter Flower Show, beginning Jan. 12 and running through March 10. How about the Winter Flower Show? This is traditional show we’ve had for years. We’re using jewel tones, dark maroon, blues, and some beautiful Asian lilies to bring fragrance into the show. It stays fairly similar from year to year. We save a lot of the plants and regrow them for the next year. The azaleas, amaryllis, velthemia—those carry over from year to year. It’s a nice fragrant show that peaks for Valentine’s week. Talk more about growing your own flowers for the shows. It’s wonderful to have a production greenhouse attached to the conservatory. I like the fact that we have the complete growing cycle within our greenhouse. We get in bulbs, seeds, and plugs: We sow them, grow them, and show them. We can really control the quality. We see visitors walk in, warm up, and de-stress for an hour or two, which is very gratifying. The conservatory is accessible and it’s open every day of the year. That’s pretty special. Como is unique that way.